I’ve wanted one of these for the longest time, by all accounts they’re built like tanks and ready for anything you can throw at them. (Sigh)…someday. Not a huge fan of those plastic-type sheaths either. Functionally they’re OK, sure, but i don’t know, they’re sort of “clangy” for my tastes. What’s the leather one like, similar? I have the F1 with the leather sheath and it’s actually really nice. Very thick leather that is both stitched and riveted. If the A1’s leather sheath is anything like the F1’s leather sheath it’s quite nice. Fallkniven makes really nice stuff. I know the review was pretty glowing but I stand by it – the A1 performs like anything else I have tested yet. While I’m more of an F1-guy all knives in Fällknivens service-line are quite simply awesome. Everything you need – nothing you don’t. 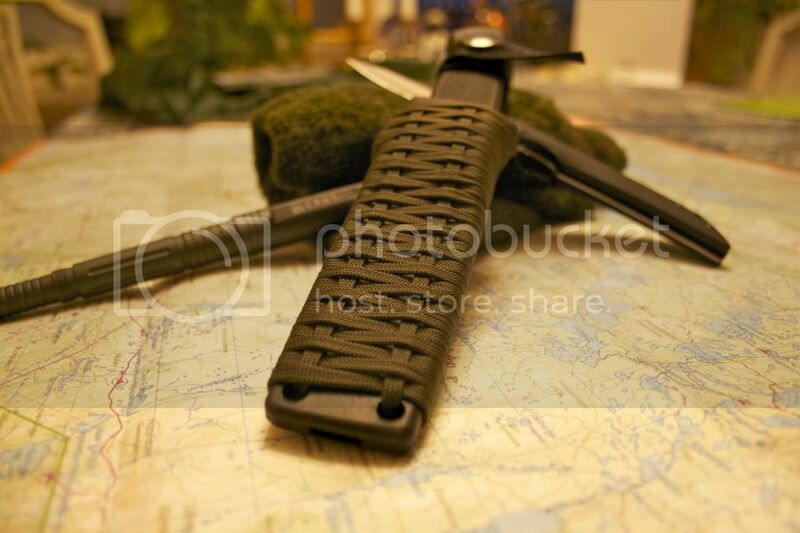 I paracord-wraped my sheath to make it prettier (and to prevent it banging against my gear), many of the guys in my platoon (motorised infantry) put some bicycle inner-tube on it and add a firesteel. The sharp 90 degree shoulder on the Fällknivens provide excellent sparks without the need to use the edge. All in all Fk is a great company from the town where I did my first year of duty – Boden. It’s a family business whose members are very friendly and give nice discounts to the poor soldiers of the garrison. I’d recommend their products to anyone, you can’t go wrong and with the A1, S1, F1 you really get what you pay and more. Oh yeah, and here’s a picture of the sheath (my work but not my pattern), IMO an elegant solution to the simple and minimalist design. Thanks for sharing man – I agree it looks great! Thanks for stopping by Lew! Great to hear a from someone who has had first hand experience with the company. I like the paracord wrap idea and the bicycle tire idea. The sheath is simple but it it’s lightweight and works. The knife is extremely impressive. I think you mean sheath. Great review, Dan! I’ve wanted one of these for a while, but man the cost is just a bit much for my wants at the moment. I do have a Fallkniven G-1 Garm. One of the nicest boot sized daggers around. What you might not know, is that the A1 is actually based on the SRK. Both are made in Japan you know. The word is that Fallkniven was a Swedish distributor for Cold Steel, but then decided to get into the manufacturing business too. They took the SRK’s basic design, which itself is based on old designs, and put out a higher end version. Also, VG1 and VG10 both come from Takefu Special Steels. There is a real possibilty that some of the shops that make Fallkniven blades also make the blades for Cold Steel. I’d love to know for certain. Very interesting RK! The similarities between the SRK and A1 are undeniable, although I sort of feel like it’s a pretty generic design and like you said, they both stem from other designs. I would be curious to know if they are made in the same shop. The build quality on a lot of CS’s stuff is pretty good so I wouldn’t be surprised. Thanks for stopping by man. Always a pleasure. PS – I will be reviewing the SRK. Not next, but likely the knife after. 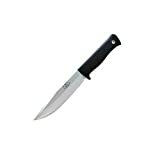 Fällkniven (FK) started out as the Swedish destributor of Cold Steel back in the day when CS really was the name of the game for larger fixed-blade utility knives. Many Swedish soldiers bought SRKs for use during the early missions to Yugoslavia and later Bosnia, my friends who were there still carry theirs and love them to bit. What then happened is that the world moved on to better things while CS decided to keep the SRK the same way it was. Steels evolved, ergonomics became more advanced. Fällkniven was also going through a generational change with the sons of the founder taking over the business, they are the one’s who decided to start designing knives with modern techniques for Scandinavian customers. The city of Boden where FK is located is north of all that’s holy and cold as hell, if a knife will break it’s up there hacking through frozen wood. Calling the A1 an upmarket SRK is not doing any of them justice. They’re different knives at different price points designed by different people for different things. I’ve never owned an SRK (that large Ricasso [and Lynn Thompson] is a turn-off) but I don’t think you could hold the two in your hand and not tell the difference. I know I can’t. Thanks for the information Lew, greatly appreciated and very interesting. I own both and I can say with utmost confidence that they are entirely different animals. The A1 is the superior tool – no doubt about it. That is readily apparent from the moment you pick one up. I really like the A1 a lot and have not handled a production knife in it’s class that can touch it (yet). That said the SRK has it’s place too, especially at it’s price point. All Fallkniven fixed blades are made by Ichiro Hattori in Seki Japan. Mr Hattori is considered the top fixed blade maker in Japan. Fallkniven folders are made by Moki, also in Japan. Hattori also makes the large Sanmai knives for Cold Steel USA Corp. But the smaller sanmais like the SRK and Master Hunter are made by Kinryu Corp of Seki. These days you can guess which are Hattoris by the price tag. Thank you for sharing the information – very interesting! Есть А1 чёрный в кожаных ножнах. Отличный нож, удобные ножны. Рабочий нож. Интересная заточка, держится хорошо. Из ножен достаётся быстро, особо, если они закреплены на бедре. Рубить более предпочтительно, чем резать. В руку берёшь и понимаешь – вещь! Лежит в руке удобно, вес ощущается, но не тянет. Переживаю, что чёрное покрытие быстро износится. Кто-то про стойкость покрытия может сказать? спасибо за комментарий, Andrey! (Thank you for commenting, Andrey!) I don’t have any experience with Fallkniven’s black coating so unfortunately I can’t comment on that aspect. Unfortunatly the Fällkniven black coating is notoriously bad for wear and flaking. It really isn’t worth it. I am new to Fallkniven (having learned about them through a knife review on Youtube) and bought my first, a U2, a couple of months ago. My thinking was that if I didn’t like it I wasn’t out much money. Well, I liked the U2 so much I went for an A1 and am really glad I did. It feels great in my hand and is well balanced. I have not had a chance to put it through its paces, but from the feel of it I don’t think it will have many problems. Thanks for building a great knife! Very well written. Very sane. I’m currently pondering the knife and appreciated this review. Thanks, Brad! Glad you enjoyed it. I appreciate the kind comment.